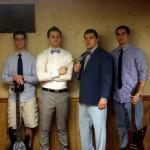 Biography: The Sayso is a four-piece rock band from Pennsylvania who performs both cover and original songs from various genres. A mix of power and finesse leads to a limitless mix of music that entertains crowds all night. Never before have drums, bass, vocals and two guitars sounded so good.